Two Birmingham-based charities have teamed up to strengthen their support for vulnerable individuals living in the Midlands. Birmingham St Mary’s Hospice and St Basils have come together for the first time ever, to help raise crucial funding to support the Midlands community. Collaborating on a first-of-its-kind event, the two charities are working in unison to extend their reach within the Midlands, allowing them to identify and assist more people in need. The Hospice, which provides vital care and support to families living with terminal illness, and St Basils, which works with young people who are homeless, are hosting a challenging, nine-hour relay race to bring more people together within their local communities. 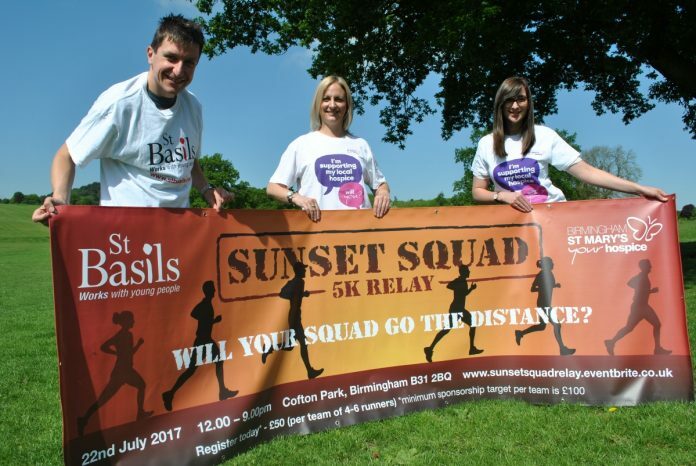 The ‘Sunset Squad Relay’ event – which takes place on Saturday 22 July at Cofton Park – sees the charities working together equally, with all funds raised going towards the two causes. Lucy Watkins, events manager at Birmingham St Mary’s Hospice, said: “Night time is usually the most difficult period for people in a Hospice and for people who are homeless, and it was this connection that initially brought Birmingham St Mary’s and St Basils together.